Ardabil (, Persian: ‎‎اردبیل, Azerbaijani: اردبیل , also Romanized as Ardabīl and Ardebīl) is an ancient city in Iranian Azerbaijan. Ardabil is the center of Ardabil Province. 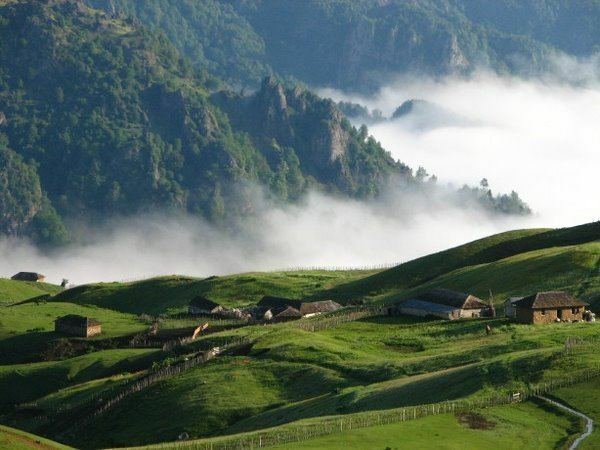 At the 2011 census, its population was 564,365, in 156,324 families, where the dominant majority are ethnic Iranian Azerbaijanis and the primary language of the people is Azerbaijani. Ardabil is known for its silk and carpet trade tradition. Ardabil rugs are renowned and the ancient Ardabil Carpets are considered some of the best of the classical Persian carpet creations. Ardabil is also known as the seat of a World Heritage Site: the Ardabil Shrine, the sanctuary and tomb of Shaikh Safî ad-Dîn, eponymous founder of the Safavid dynasty. The name Ardabil comes from the Avesta "Artavila" which means a holy town or a holy place. Ardabil is located on the Baliqly Chay River, about 70 km (43 mi) from the Caspian Sea, and 210 km (130 mi) from the city of Tabriz. It has an average altitude of 1,263 metres (4,144 ft) and total area of 18.011 km2 (6.954 sq mi). Neighboring on the Caspian Sea and the Republic of Azerbaijan, this city is and has been of great political and economical significance throughout history, especially within the Caucasus region. It is located on an open plain 1,500 metres (4,900 ft) above sea level, just east of Mount Sabalan (4,811 m), where cold spells occur until late spring. The province is believed to be as old as the Achaemenid era (ca. 550–330 BCE). It is mentioned in the Avesta, where prophet Zoroaster was born by the river Aras and wrote his book in the Sabalan Mountains. During the Parthian era, the city had a special importance among the cities of Azerbaijan. Some Muslim historians attribute the foundation of Ardabil to king Peroz I of the Sassanid Empire. The Persian poet Ferdowsi also credits the foundation of the city to Peroz I. Ardabil suffered some damages caused by occasional raids of Huns from the 4th to 6th century CE. Peroz repaired those damages and fortified the city. Peroz made Ardabil the residence of provincial governor (Marzban) of Azarbaijan. Due to its proximity to the Caucasus, Ardabil was always vulnerable to invasions and attacks by the mountain peoples of the Caucasus as well as by the steppe dwellers of South Russia past the mountains. In 730-731, the Khazars managed to get past the Alan Gates, defeated and killed the Arab governor of Armenia named Al-Jarrah ibn Abdallah on the plain outside the town of Ardabil, and subsequently captured the town, as they continued their conquests. During the Islamic conquest of Iran, Ardabil was the largest city in north-western Iran, ahead of Derbent, and remained so until the Mongol invasion period. Ardabilis fought the Mongols three times; however the city fell after the third attempt by Mongols, who massacred the Ardabilis. Incursions of Mongols and subsequently the Georgians, who, under Tamar the Great, captured and sacked the city with some 12,000 citizens reputedly killed, devastated the city. The city however recovered and was in a more blossoming state than before, though by this time the principal city in the Azerbaijan region had become Tabriz, and under the later Ilkhanate, it had become Soltaniyeh. Safavid king Ismail I, born in Ardabil, started his campaign to nationalize Iran's government and land from there, but consequently announced Tabriz as his capital in 1501. Yet Ardabil remained an important city both politically and economically until modern times. During the frequent Ottoman-Persian Wars, being close to the borders, it was often sacked by the Ottomans between 1514 and 1722 as well as in 1915 during World War I when the former invaded neighboring Iran. In the early Qajar period, crown prince Abbas Mirza, son of then incumbent king (shah) Fath Ali Shah Qajar (r. 1797–1834) was the governor of Ardabil. With Ardabil already once being sacked by the Russians during the Russo-Persian War of 1804-1813, and this being the era of the Russians steadily advancing into the Iranian possessions in the Caucasus, Abbas Mirza ordered the Napoleonic general Gardane, who served the Qajars at the time, to strengthen and fortify the town with ramparts. During the next and final war, the Russo-Persian War of 1826-28, the ramparts were stormed by the Russian troops, who then temporarily occupied the town. The town's extensive and noted library, known as the library of Safi-ad-din Ardabili, was taken to St. Petersburg by General Ivan Paskevich on the feigned promise that it would be brought to the Russian capital in order to be kept safe until it could be returned; it was never returned. After the Russo-Persian Wars, Ardabil re-prospered. With the town situated only 40 kilometers from the new Russo-Iranian border imposed by the Treaty of Turkmenchay (1828) and Iran's loss of its territories in the Caucasus, Ardabīl became an even more important stop on a major caravan route used to import European goods from Russia to Iran. In 1872, when Max von Thielmann was in Ardabil, he noted in his published book of 1875 the extensive activity at the town's bazaar as well, as the presence of many foreigners in the town. He estimated its population at 20,000. During the early Iranian Constitutional Revolution, Ardabil as well as the rest of Iranian Azerbaijan were occupied by the Russians who stayed until the eventual collapse of the Russian Empire in 1917. In the heart of the Ardabil city, this bazaar stands as old as the Islamic period. Its shape was described by the historians of the 4th century CE as a cross, extending in four directions with simply designed domes. Most sections of the bazaar were constructed and renovated during the Safavid and Zand periods. Produce Bazar, Ardabil and vicinity This is the fresh produce bazaar on the Meshkin Shahr gate in the city of Ardabil. Vendors buy directly from farmers and distributors. One of the main sights in the city of Ardabil in north-west Iran is the shrine of Shaykh Safi al-Din Ardabili, who died in 1334. The Shaykh was a Sufi leader, who trained his followers in Islamic mystic practices. After his death, his followers remained loyal to his family, who became increasingly powerful. In 1501, one of his descendants, Shah Isma'il, seized political power. He united Iran for the first time in several centuries and established the Shi'i form of Islam as the state religion. Isma'il was the founder of the Safavid dynasty, named after Shaykh Safi al-Din. The Safavids, who ruled without a break until 1722, and then intermittently until 1757, promoted the shrine of the Shaykh as a place of pilgrimage. The third line is a signature, 'The work of the slave of the portal, Maqsud Kashani.' Maqsud was probably the court official charged with producing the carpets. He was not necessarily a slave in the literal sense but called himself one to express humility, while the word for 'portal' can be used for a royal court or a shrine. Perhaps Maqsud meant both, as in this case the court was the patron of the shrine. The fourth line contains the date 946 in the Muslim calendar, which is equivalent to 1539–1540 CE. The two Ardabil carpets were still in the shrine of Shaykh Safi al-Din in 1843, when one was seen by two British visitors. Thirty years or more later, the shrine suffered an earthquake, and the carpets were sold off, perhaps to raise funds for repairs. The damaged carpets were purchased in Iran by Ziegler & Co., a Manchester firm involved in the carpet trade. Parts of one carpet were used to patch the other. The result was one 'complete' carpet and one with no border. In 1892, the larger carpet was put on sale by Vincent Robinson & Co. of London. The designer William Morris went to inspect it on behalf of this museum. Reporting that the carpet was 'of singular perfection … logically and consistently beautiful', he urged the museum to buy it. The money was raised, and in March 1893 the Museum acquired the carpet for £2000. The second, smaller carpet was sold secretly to an American collector, and in 1953 it was given to the Los Angeles County Museum of Art. The Ardabil carpet hung on the wall in this gallery for many years. In 2006, the museum created the case in the centre of the gallery so that the carpet could be seen as intended, on the floor. To preserve its colours, it is lit for ten minutes on the hour and half-hour. Ardabil is associated with historical confusion between the 893 Dvin earthquake which was often wrongly documented as the 893 Ardabil earthquake due to the similarity of the Arabic name for city of Dvin in Armenia, 'Dabil' to Ardabil. On 28 February 1997, a destructive earthquake hit the Ardabil area. At least 965 people were killed, 2,600 injured, 36,000 homeless, 12,000 houses damaged or destroyed and 160,000 livestock were killed. Severe damage was observed to roads, electrical power lines, communications and water distribution systems around Ardabil. Cold and semi-arid (Köppen BSk), many tourists come to the region for its relatively cool climate during the hot summer months. The winters are long and bitterly cold, with a temperature plummeting to −25 °C. The annual rainfall is around 380 mm (15 in). In addition to these, in many villages of Ardabil, relics of ancient monuments, including tombs have been found. Being a city of great antiquity, the origins of Ardabil go back 4,000 to 6,000 years (according to historical research in this city). This city was the capital of Azerbaijan province in different times, but its golden age was in the Safavid period. Many hot springs and beautiful natural landscapes are in Ardabil and around which attract tourists. The mineral springs of Ardabil (Beele-Darreh, Sar'eyn, Sardabeh and Booshloo) are notable throughout Iran for their medicinal qualities. Many beauty lakes: the largest of which are Ne'or, Shorabil, ShoorGel, NouShahr and Aloocheh that are the habitats of some species of water birds. The beautiful Lake Ne'or is located in a mountainous area 48 km south-east of the city of Ardabil. It covers an area of 2.1 km² and has an average depth of 3 metres. It is fed by springs in the lake bed. The economy of Ardabil is partially agricultural, partially tourist based, with some industries in operation. The Iranian government in 2006 announced plans to build "the largest textile factory of its kind in the Middle East" in Ardabil. Arta Industrial Group (AIG) has one of the largest textile conglomerates in Iran, which is located in the provinces called Qazvin and Ardabil. The group has received numerous awards for being one of the top 20 exporters and industrial groups in Iran since 1998. It is the first company to produce high-density fiberboard (HDF), medium-density fiberboard (MDF), laminate flooring and multi-layer films in Iran. AIG has the first private industrial site in Iran in the city of Ardabil, which has fifteen main factories owned by (AIG). This Industrial zone covers an area of 100 hectares and Residential Area for engineers and managers of the company. Ardabil is host to a few football teams. The most popular team in Ardabil is Shahrdari Ardabil who in 2014 were promoted and play in the Azadegan League, Iran's 2nd tier league. The city is renowned for producing great forwards, namely former Bayern Munich player and record international goal scorer Ali Daei.